I have to admit, this cover makes Fumi look kinda hot. Synopsis: Picking up from where we left off in the last chapter, Fumi and Sharna follow Ikusa around the beach and Sharna is curious as to what he does for a living. Isumi suddenly pops up from out of nowhere to offer an explanation and tells them that his name is Ikusabe Yamato, he’s a lifesaver, 28 years old and has a strong sense of justice. Fumi goes straight to the point and asks Isumi if he’s single since she’s readily volunteering information and Isumi responds with a totally disgusted face. She offers to help out anyway and just goes up to Ikusa and asks him if he’s single because Fumi wants to date him. Ikusa tells them that he’s not seeing anyone right now nor does he plan to, but that he would probably fall in love with someone who holds the same ideals of saving anyone who is in trouble just like him. 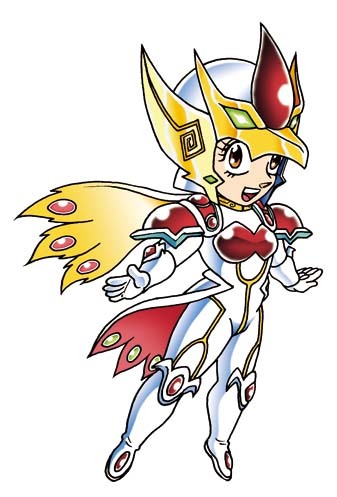 At this Fumi decides that she needs to become a lifesaver too and goes off to “eliminate” troublemakers from the beach. 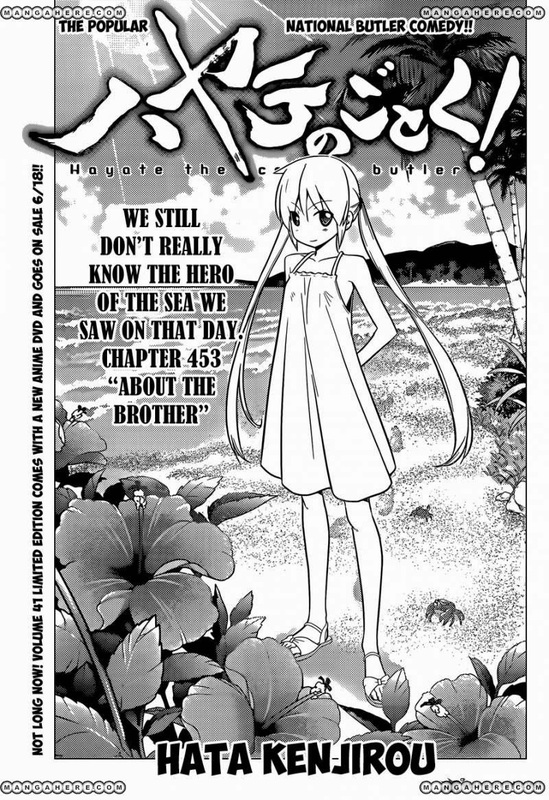 She eventually stumbles upon Hayate – who, as we all know, is in dire straits having been left all alone to man the seaside restaurant by team Café Donguri last chapter. Fumi decides she’s going to help him, but not without unintentionally poking fun at his situation first. She proposes selling Takoyaki using a sleazy cost-cutting scheme. 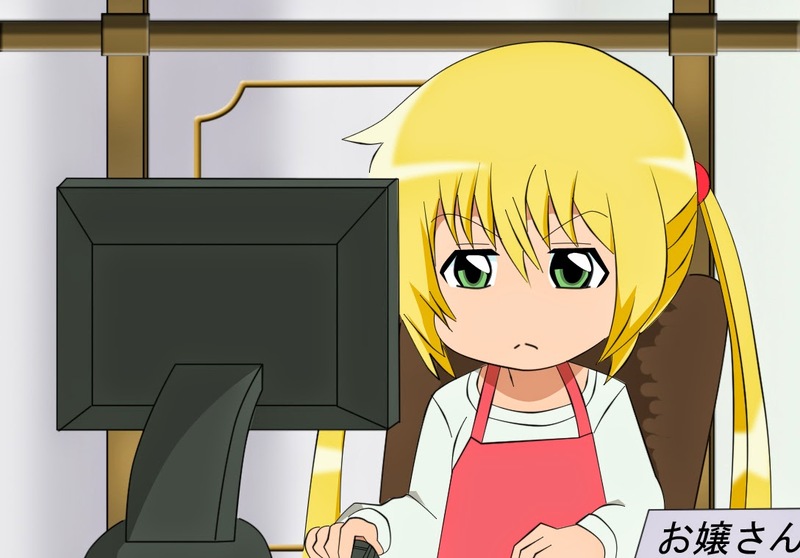 Hayate is unconvinced, but all of a sudden Yukiji pops up because she’d heard that Hina was sick. She proposes the same takoyaki scheme that Fumi suggested. 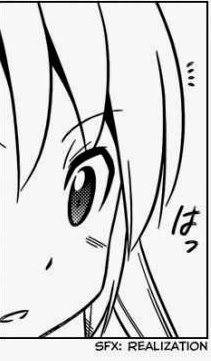 Hayate dismisses their ridiculous suggestions, but suddenly, his face lights up with a look of realization. 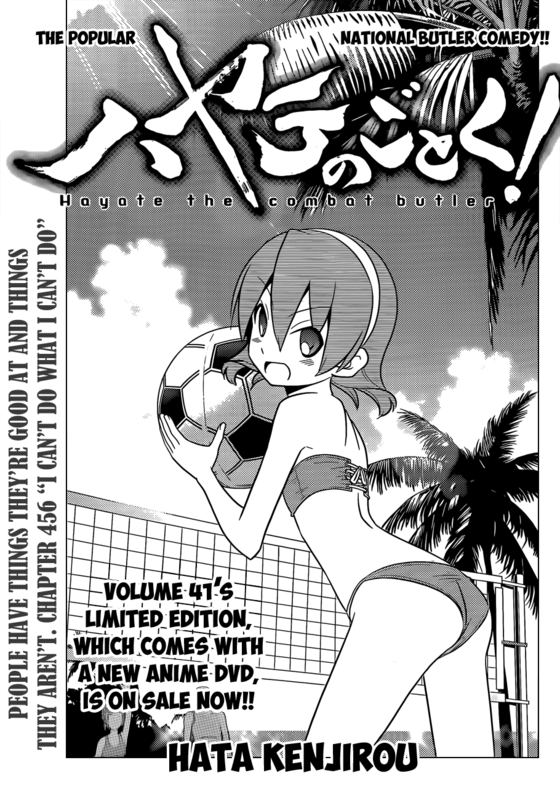 Review: First of all, I need to admit that all of my previous speculations about how Hayate was going to win this competition seemed to have been proven wrong in this chapter. While there is no clear solution yet, it doesn’t seem likely that any of the scenarios that I laid out would come true. Furthermore, I said that we’ve probably seen the last of Fumi and Sharna for a while, but it looks like they’re here to stay for this arc. It was nice to see Isumi making an appearance in this manga again – and she’s still as cute and funny as ever. Especially when she semi-trolls Fumi. Looks like Yukiji’s here too, so I guess she really does care about her sister – even if she acts irresponsible most of the time. 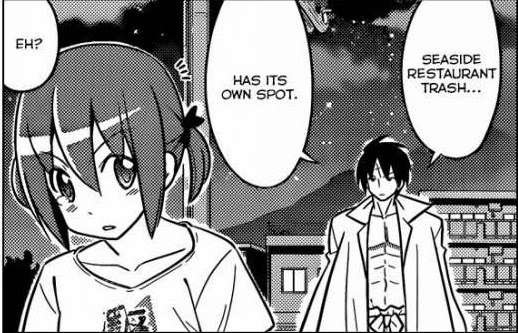 One other aspect of Ikusa I’ve noticed is that Isumi implied that she’s on to whatever his plans are and he seems to have planned out things ahead of time – including Fumi’s meeting with Hayate. In other words, Ikusa’s a scheming manipulator just like someone else we know… and I’m not talking about Nagi’s grandfather ;). Over-all, this was once again a really funny and enjoyable chapter. This beach arc may be going on for much longer than most fans can stomach, but I personally don’t mind if it’s this funny all throughout. Speculation Fanart Corner: Hata’s given me nothing to work with for this chapter, so have some fanart instead. A certain goddess whispered this scenario into my ear… and I just had to draw it! Open the pic in a new tab/window if you can't read the text. 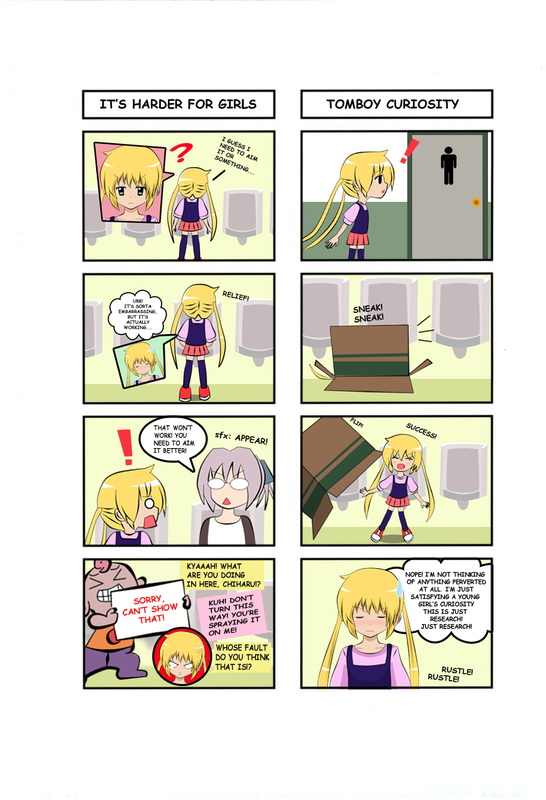 This is a 4koma, so read the right hand panels from top to bottom first. What do you think? Would Nagi actually try this? Hamster cover this time. She actually looks nice with the new art style. Synopsis: Left with only Nagi and Hamster to help him out at the seaside restaurant, Hayate says it would be better to just give up, but with one huge slap from Nagi and some words of encouragement from the hamster, he declares that their determination has reached him and they go on and open the restaurant anyway. Hit him harder, Nagi. He needed that! The restaurant is packed and it seems like all is going well with the three of them working together, but after only an hour, both Nagi and Hamster are exhausted and decide to go back to the hotel and support Hayate by watching over him... from the hotel bed. He should have seen this one coming given Nagi's stamina. We leave our desperate butler alone for a bit with his predicament and revisit two characters who haven't made an appearance in this manga since forever, Fumi and Sharna. Anyway, Fumi wants to go to the beach and thinks up some cockamamie excuse to go there and Sharna just humors her and plays along as usual, but not without the usual zingers. 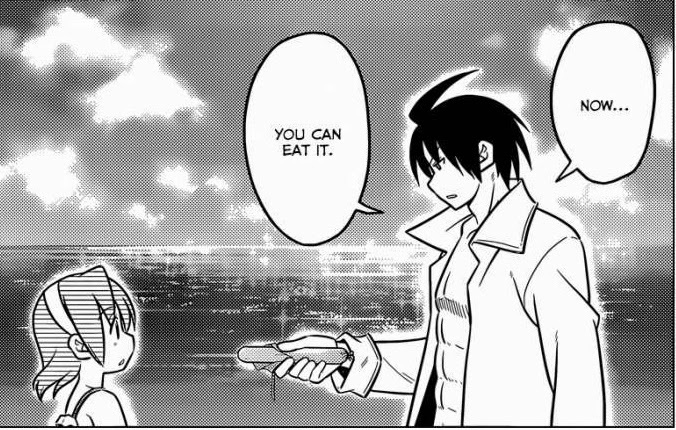 They stumble upon Ikusa who picks up a fish sausage that Fumi threw and opens it up for her. He then leaves and tells them to enjoy their time at the beach. 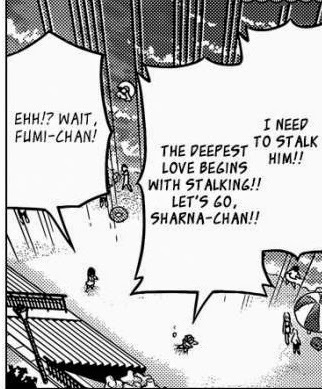 Fumi instantly falls in love with him and declares that she's now going to stalk him. Review: Well, I suppose it was about time for Fumi and Sharna to show up, but I'm surprised that Hata didn't show us some of the more significant side characters such as Wataru and Saki as well as Isumi and Sakuya. This line was kinda funny, actually. Anyway, I didn't care much for the Fumi and Sharna segment, but I did get a kick out of watching Hayate get b|tchslapped by Nagi. I'm also quite surprised at how easy it was to convince him even though he gave it all that thought that it was impossible from the very beginning. 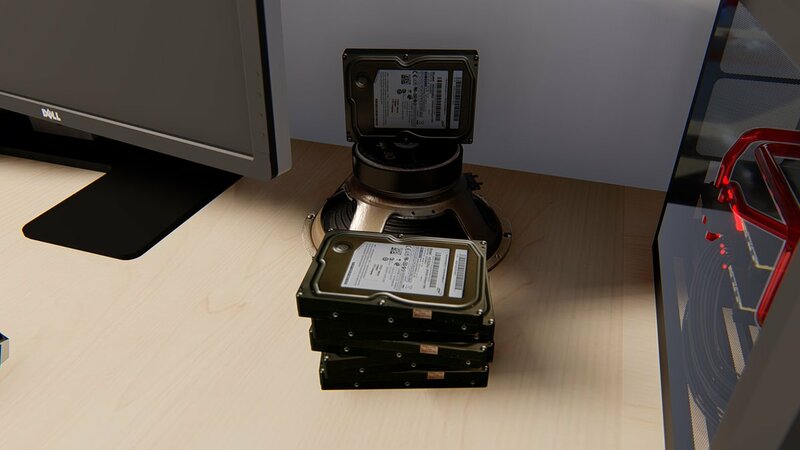 Did he somehow think that they could make it through with sheer determination alone? Anywayz, looks like he just managed to dig himself into even more trouble this time. Speculation corner: One very Hata-ish solution to Hayate's problem would be for Ruka to suddenly show up and endorse the restaurant as well as temporarily man it with her TV crew. 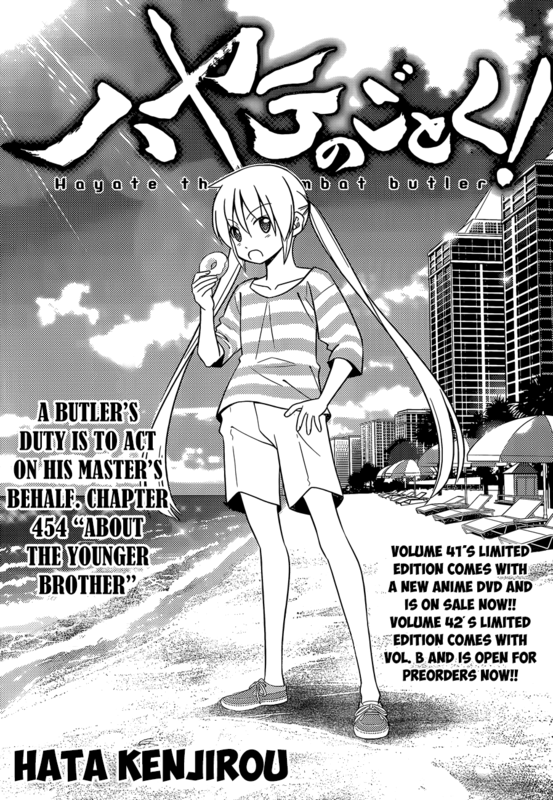 In any case, I'm actually kinda glad that Nagi and Hamster are sort of out of the picture as well with this chapter since this whole matter is really between the brothers and I think it's time for Hayate to receive a little bit of character development on his own. It would be easy to write in Athena suddenly showing up and using her wealth to help him out, but that just wouldn't seem right. One other way to resolve the problem would be for Nagi and company to return in full force with Athena, Hina, Chiharu, Kayura and perhaps even the Hakuo baka-trio and Fumi and Sharna in tow? Isumi and Sakuya could also just stumble upon them and help out as well. This way, Hayate's problems would be resolved because of the friends that he has to help him out -- as opposed to Ikusa who needs to be invincible all the time because he works alone. Pretty shounen-ish way to end this arc -- and rather fitting too, I might add. Anyway, no new fanart from me this week. I'll see if I can do a few scribbles for the next chapter. 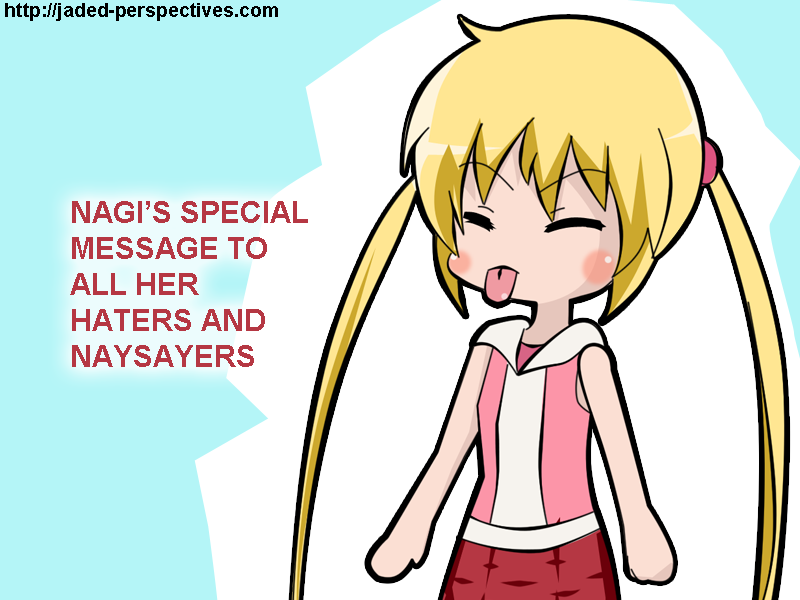 Synopsis: Alrighty… Hayate has a little chit-chat with Ikusa. It’s mostly about his resolve to protect Nagi no matter what happens and his reason for doing so – which is because she saved his life. 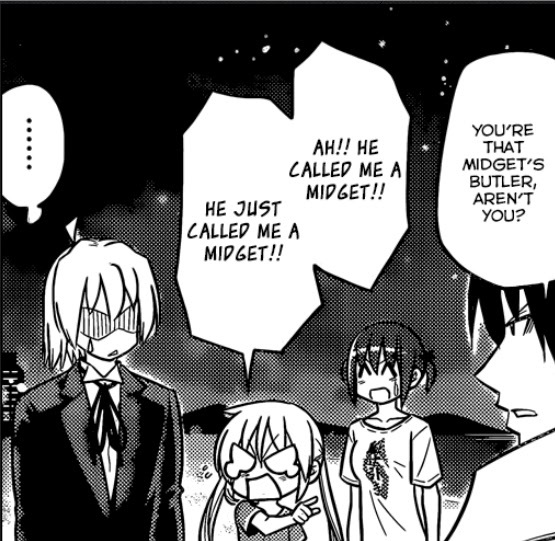 Ikusa calls Nagi a midget early in the conversation, which really ticks her off, but Hayate ignores it because he thinks that Ikusa might have something more important to say. 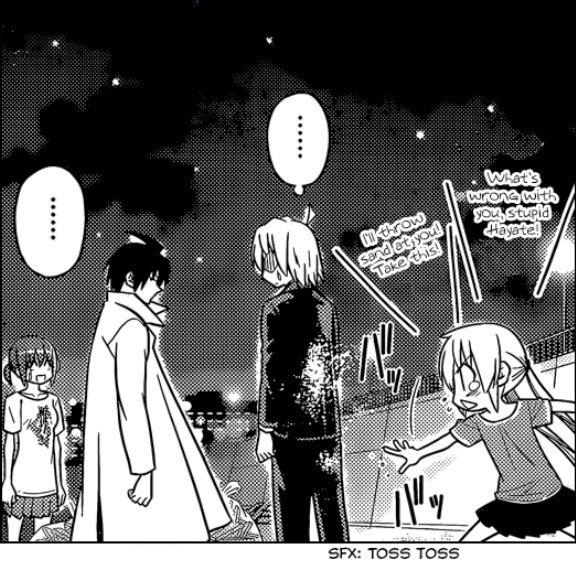 Nagi starts throwing sand at Hayate in a comedic way. Which is pretty funny considering that he’s having a serious conversation with Ikusa while this is happening. Ikusa also reveals that he’s been huddling together with Hina on that island and doing “all sorts of lewd things” as Ikusa would put it. 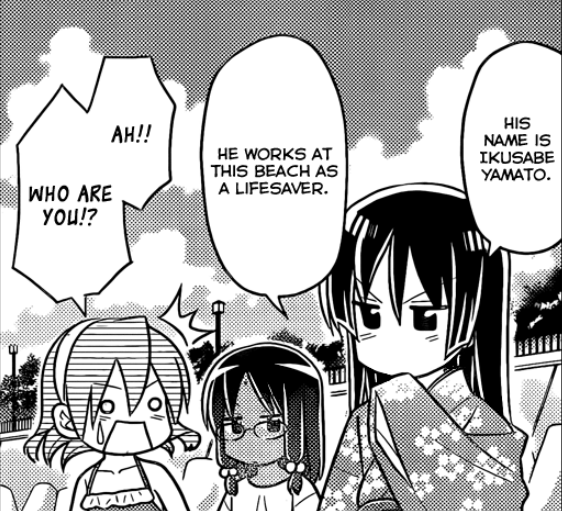 This ticks off Ayumu as well and she and Nagi decide to throw sand at Hayate together. While removing sand from his shoes, Hayate explains why he’s so devoted to Nagi, but Ikusa asks him if he can die for someone and advises him to cast aside his memories and the people he finds important in his life so that no one would be sad if he died. He then leaves and points the way to take out the trash. 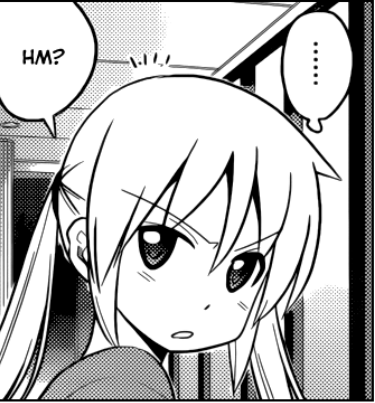 Nagi is suspicious as to whether Ikusa has really lost his memories or not and adds that she doubts that Hayate would ever need to risk his life. In any case, the competition is still on. I'll throw sand at you! Back at the hotel on the next day, Hina is feeling under the weather and the little wisps around her suggests that it might have something to do with a curse from some of those ghosts on that island. In any case, she can’t help out at the seaside restaurant and neither can Maria who will be looking after her. Neither can Kayura and Chiharu who had been staying up all night at the arcade – as pointed out by Athena, who is now back in her Alice form. Alice says she can’t help out either because she has something else to do, which leaves Hayate with team café donguri: Nagi and Hamster. Good idea, girls. Do it! Do it! 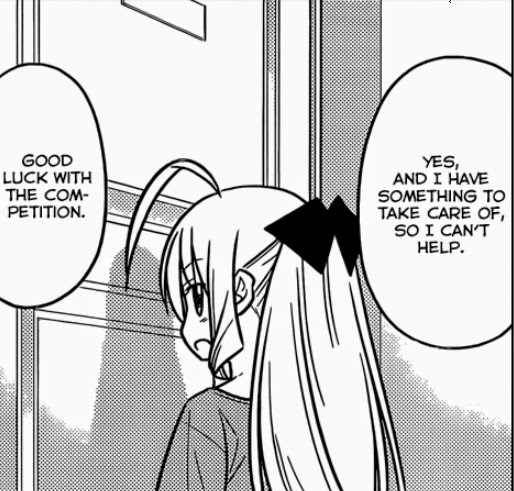 After a bit of contemplation, Hayate realizes that he can’t win with this team and gives up on the competition altogether. We’ll have to wait for the next chapter to see what happens next. Review: No big reveal yet for this chapter. Ikusa still didn’t clearly say why this competition was “no longer a joke” after last chapter’s cliffhanger. I suppose it's implied that he's testing Hayate's resolve to see if he can live up to his promise to protect Nagi. 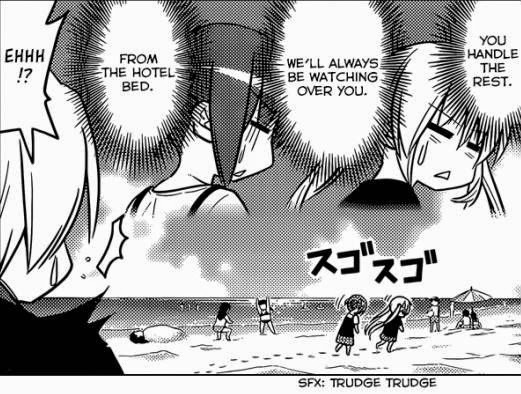 At least Hayate has made it clear in this chapter that he’s not protecting Nagi because of his financial debt to her – as the anti-Nagi crew would have you believe. It’s still not an “I’m in love with her,” but it’s a step in the right direction, at least. Sure thing, Archer. They've gotta give this guy Archer's voice if he's ever animated. The humor was spot-on again in this chapter. 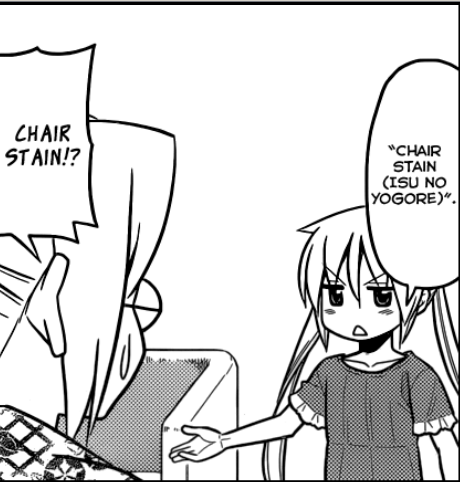 Hata’s really gotten back in touch with his humorous side with this latest arc. Nagi is especially sensitive about her height and she resorts to funny, mischievous behavior just to get back at Hayate – although maybe it’s Ikusa she should be throwing sand at, but he looks too mean to play around with. The little interactions between Nagi and Hamster were also funny – although I must admit, not as funny as Athena x Hinagiku. There's your lovely, caring, selfless A-tan. Speculation corner: Anyway, no speculation corner this week as Hata hasn’t revealed enough info for me to make any speculations about anything at all. Made a new Nagi fanart based on Cuties though. Also, just in case you haven’t heard, the first of the 2014 OVAs are out and features Nagi and Hina, as expected. The bigger reveals are that Hina’s chapter features an abbreviated version of the Golden Week Arc and finally animates teenage Athena and that there’s apparently a teaser for the Izumi alternate universe ending comic at the end of the OVA. Well, I haven’t seen it yet myself (I’ll rectify that tonight), so this is all second-hand info based on the discussions in Doughnut Gunso’s blog. I suppose one thing I can speculate on is that my fanart of Ikusa in a mask and kidnapping Nagi thereby triggering Hayate's demon mode might not be so far-fetched. I wouldn't put it past him to go that far just to test Hayate's resolve. 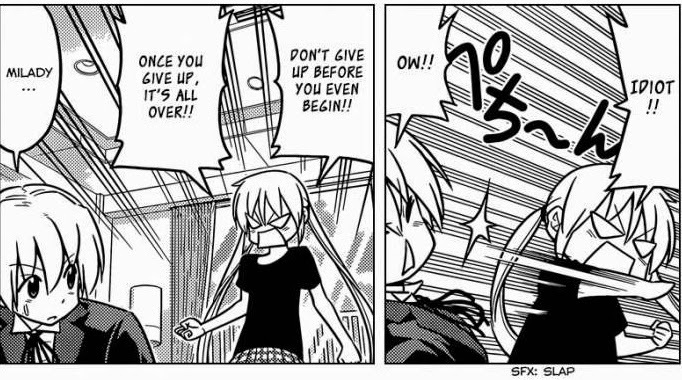 He might be in for a surprise if Hayate pulls out the titular Hayate no Gotoku! Huzzah! Another Nagi cover... dun really like the new art style though. There's a SFX for realization? The group (without Nagi) return to the seaside restaurant where Hayate is furiously working on making curry using the so-called secret spice that they found on the island. He claims to have a secret cooking technique even if it’s just boxed curry… which turns out to be nothing more than a sleazy restaurant owner’s cost-cutting, profit-maximizing scheme of using nothing but boxed curry and making it seem like freshly-cooked curry. Hina's back and kinda pissed off. 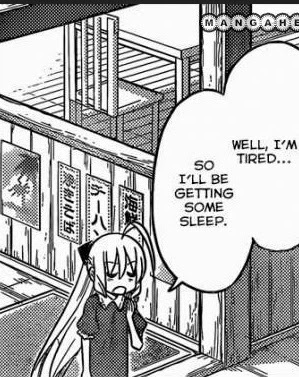 Athena, who is now in Alice form once again, says she’s tired and leaves Hayate to his sleazy business. Ayumu chooses to stay behind while Kayura, Chiharu and Hina leave as well. They encounter Nagi speaking with the front desk on the way and she says she’s been talking about whether the Hotel makes a lot of money or not. These two kinda look good together. Hamster senses that it’s her chance to make a move on Hayate and imagines a lovey-dovey scenario of helping him cook curry, but he just sends her out to take out the trash consisting of empty boxes of curry. Outside the hotel, Hamster is in a bit of a pinch since she doesn’t know where she should leave the trash. Just as she’s contemplating on leaving it secretly at the neighborhood gathering point, Ikusa appears and offers to take the trash bags from her. They talk a bit about Ikusa and why he’s always saving people and about Hayate and Nagi and why he’s dressed like a butler and -Ayumu does her best to explain things – although she does a terrible job at describing Nagi’s appearance. Hayate appears from out of nowhere since he’s feeling a bit guilty for sending Ayumu to take out the trash on her own and Ikusa scolds him about that, but he counters that he wouldn’t have had to do that if it wasn’t for Ikusa in the first place. Ikusa says it was just a joke. 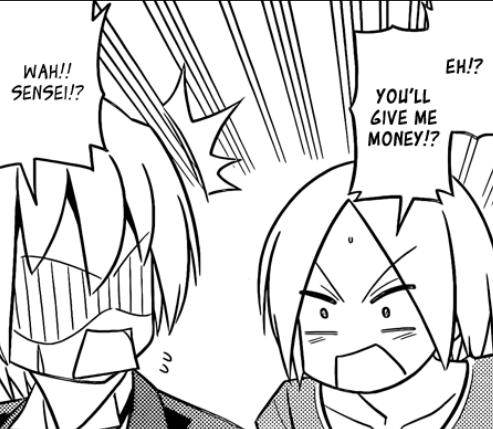 Hayate gets really agitated about Ikusa’s obsession with money and starts lecturing Ikusa about making money instead of saving people. Where the eff is this quote from? Suddenly, from out of nowhere, a wild Nagi appears with a quote from “Kenshin” it seems… I seriously do not remember that (Hayate says it’s not a famous quote anyway) if she’s talking about Rurouni Kenshin. Anyway, she explains that the hotel that they’re staying in called Asuki Hotel Resort is actually Ikusa’s name spelled backwards. In other words, he’s the owner. 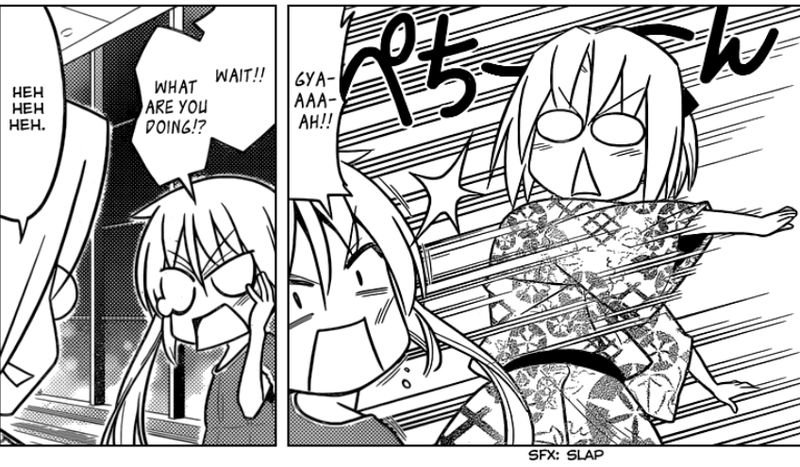 Hayate is dumbfounded, but Ikusa just calmly restates that the bet was just a joke. 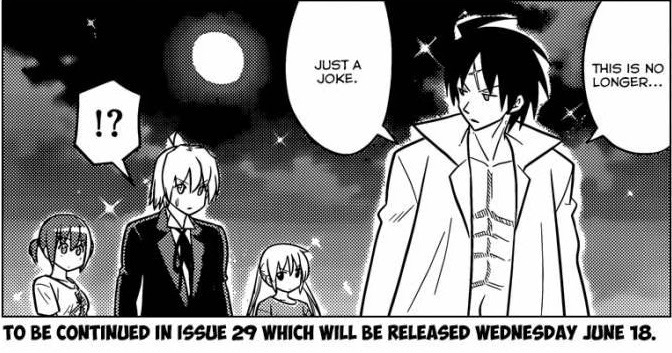 Hayate demands to have the stone back right now, but Ikusa still refuses and says that it’s no longer just a joke. Review: Well, allow me to summarize what I liked about this chapter: Nagi! Haha! Joking aside, I really did like seeing her more capable side once again in this arc. It seems Hata’s trying to establish that Nagi can be the sensible one in these types of situations just like in the Mykonos arc as well as HIAPOE, CTMEOY and the last episode of Cuties. Anyway, I like that she was the one to figure out Ikusa’s secret – because she’s the main character after all! Can’t have her being useless all the time. 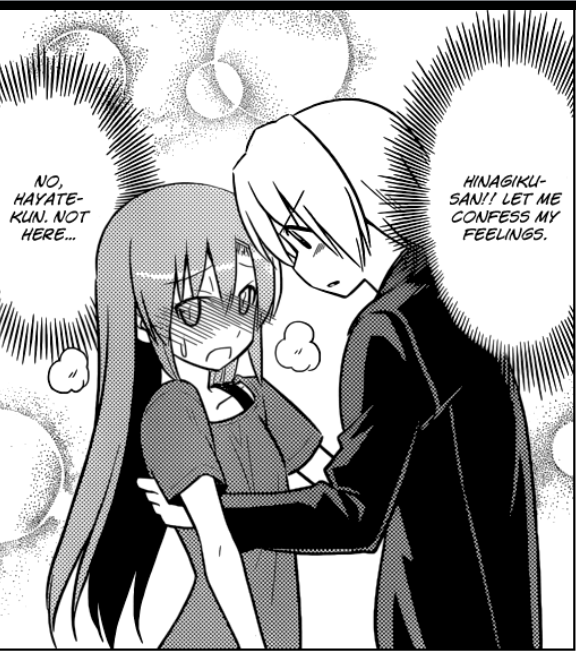 Anyway, I’m kinda liking seeing Hayate get all agitated because he’s usually so calm about his personal problems. It’s funny seeing his reactions when he’s pushed to his limits. Plot-related stuff: The biggest reveal… and possibly a shocker for some, is that we now find out that Ikusa is pretty rich since he does own the hotel that the group are staying in and it seems to be a luxury hotel based on the accommodations (luxurious public bath and all). Also, the murder island group have finally returned without any incident and Athena is back in her Alice form for now. It looks like she’s here to stay for this beach arc. Lastly, I believe this chapter points out something important about Hayate and his desire to protect Nagi. As Ayumu points out, it has nothing to do with his financial debt to him. He wants to protect her because she “saved” him. That’s all that the hamster says – and she’s most likely correct. Speculation corner: Not much to speculate on at this point. I can’t say much about Ikusa’s chapter cliffhanger, but I can say something about his character. 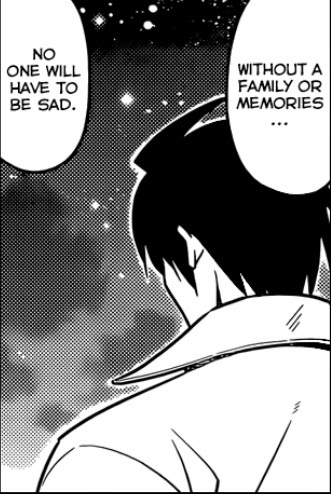 Seeing how much he suspiciously knows about his own past based on his conversation with Ayumu and how he’s actually humoring Hayate instead of just sending him away and not giving him the stone entirely, I’d say this chapter all but confirms my past speculation that he hasn’t really lost his memories and has just been pretending all this time. He even goes as far as to say that the whole bet was just a joke. Based on the HIAPOE design. I think she looks really pretty with her hair down like this. Have a Nagi fanart. I drew this because I was inspired when I recently watched Heaven Is A Place On Earth again on Animax and I thought Nagi looked really pretty with her hair down in that one scene. 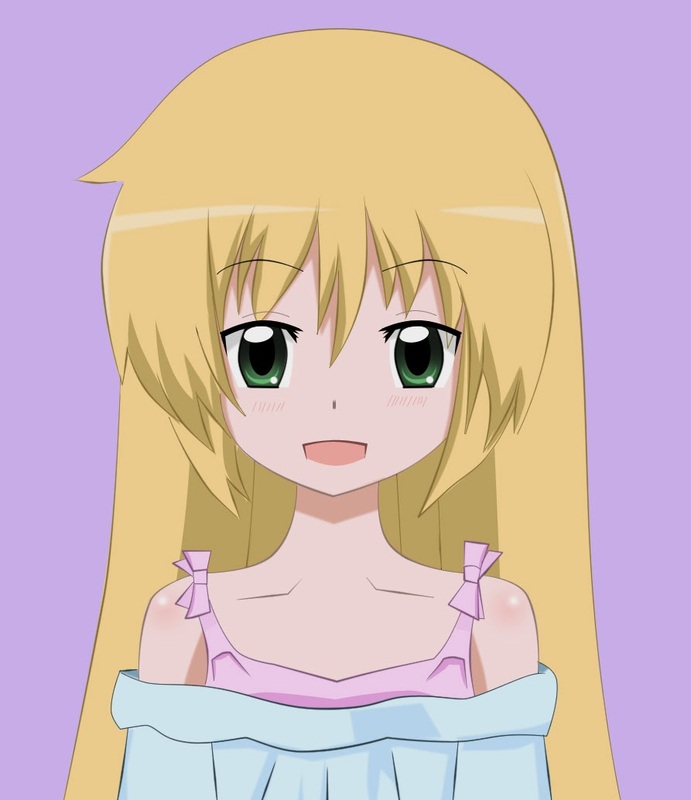 I think Hayate might take more notice of her if she drops the twin tails every once in a while like this. C’mon, Hata! Just draw a scene where Hayate blushes at seeing Nagi looking so pretty and we’ll know that it’s all over… for everyone else, that is :D.
Edit: Just occurred to me that Ikusa's initial reason for the bet might have been just to tease Hayate, but the cliffhanger most likely implies that he can't give the stone to Hayate because of his recent conversation with Athena. What a totally defenseless pose. Synopsis: Leaving Hayate, Hina, A-tan, Ikusa and their "serious business" for a while, we check back in with Nagi and the others left behind at the hotel. 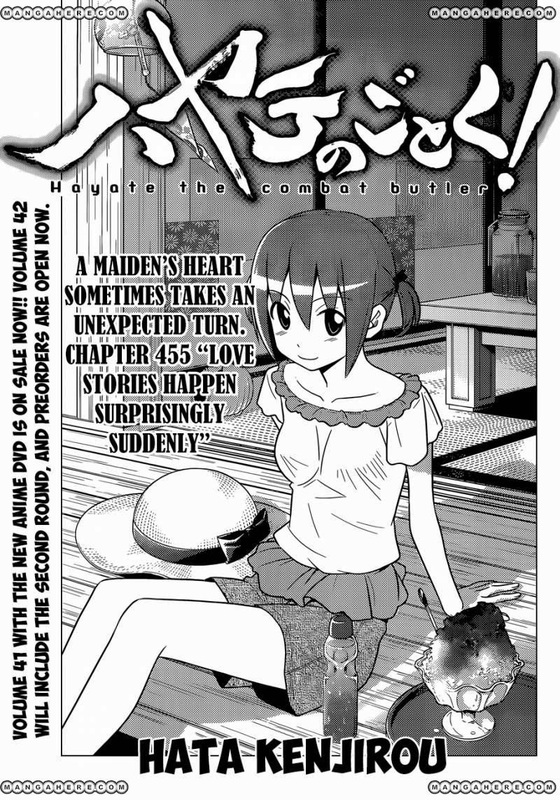 The chapter opens with a pure fanservice scene of Chiharu together with Kayura in the Hotel's public bath. Hamster thinks this is happening. Hamster is a bit worried that Hinagiku might have already confessed to Hayate and that they are now sharing a nice little romantic moment on that island, but Chiharu says they're probably fighting ghosts and pirates right now - to which Nagi agrees given that apparently, both of them have terrible luck, but Hina just hides it with her athleticism. Coming out of the bath, Chiharu is greeted by a very lazy Nagi who wants some Haagen Daazs but is too lazy to go and get it herself. She tells Chiharu to go and buy some for her, but Chiharu refuses -- so Nagi suggests that they play a game called "object shiritori" which she just made up on the spot. Basically, it's the same as a normal game of shiritori except that you need to bring the actual object instead of just saying the word. Everyone else (Maria, Kayura, and Hamster) decide to join in and the game really heats up and goes on for a while until finally, Nagi gets a "ha" syllable, which she finally uses as an excuse to just go and buy some Vanilla Haagen Daazs herself. The chapter ends her, but not without a surprised expression from Nagi... which we'll find out about in the next chapter. Review: Well, nothing much to review here, even though I am still happy to see Nagi appear in this manga again. The new art style kinda makes her seem a bit taller and more like a teenager than a kid, but that's just me. That fanservice shot of Chiharu might have been hot... if only she didn't have the same face and hair as Hayate in that scene. Cruel Woman... actually made me laugh. 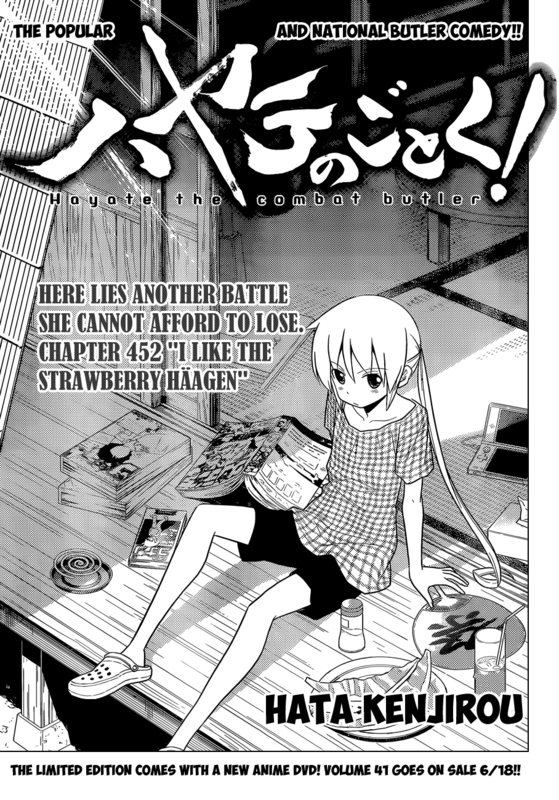 Anyway, looks like Nagi is on lazy mode again without Hayate around, but even this chapter shows that she's actually becoming a bit more independent in that she can actually buy ice cream on her own now! Progress! Character development! Umm... seriously though, it's these little things that show that she's at least grown a bit as a character throughout this manga. 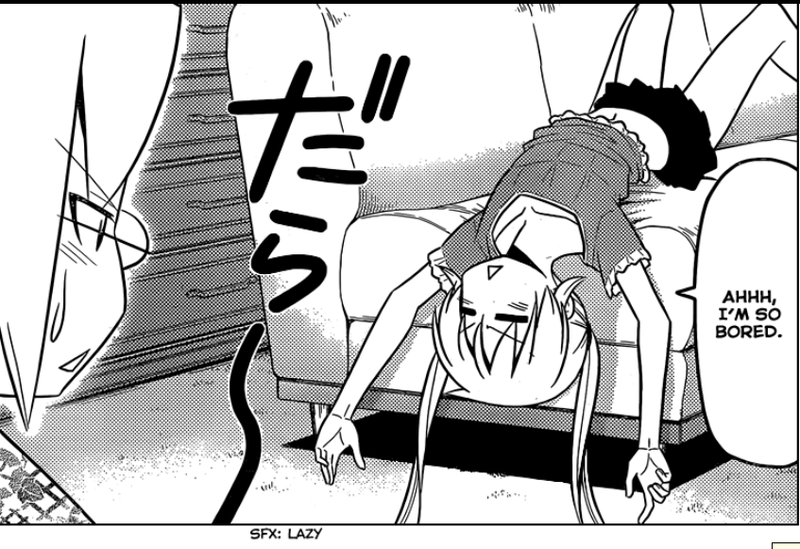 A few hundred chapters ago, she probably wouldn't have known how to go out and buy ice cream on her own, but in this chapter, she can go and do it on her own, but refuses to out of pure laziness. The humor is kind of a hit or miss for this chapter, but it's mildly amusing at least. One thing I noticed is that in the chapter cover, Nagi obviously has a 3DS XL, but those haven't been invented yet in the manga's timeline. I think this was intentional from Hata though. Over-all, this chapter wasn't too bad, even if it was just a way of checking in with the rest of the cast who are not too plot-relevant at the moment. I was just one Nagi-less chapter away from screaming out: "NAGI WHERE!?" too. 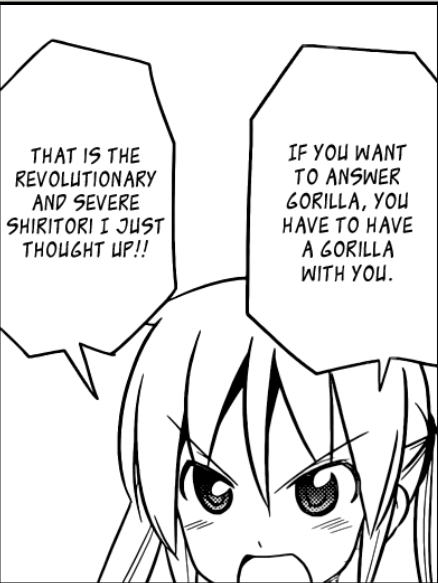 So I suppose Hata sort of read my mind... or the mind of Nagi fans everywhere with this chapter. I don't have a speculation corner for this week, but I do have some fanart for you Nagi fans out there. Cute, ain't she? The art style is a pastiche of the art from the Miku song, "15 Years of Pursuing a Cute Boy."